I'm a developer who is interested in add new functions to this gadget and to translate it into spanish (cuz i use it all time...). So, can i have the source? If i can't, would be fine to add window resize hability and other necesary stuff. thanks btw and keep up the good work! Thanks, but I am not going to share development tasks lately. However, I am always open for feature requests, if you check the changelog on this forum, you can see that a lot of feature requests has been implemented already. What do you mean on "window resize ability"? I think it is already supported. Other feature requests are also welcome. @Lostciti: you should post your wish list. - is it possible to get the focus when hovering the widget? If I want to scroll events with the mouse wheel, I need to click the widget before scrolling. - show a tooltip when hovering event with a long description that does not fit in the widget. I put the question on my list and will find out what could be done there. Ideas are welcome. Pffff... I really-really-really hate dealing with themes Btw, with Googler, you can create your own themes. And the description consists of...? 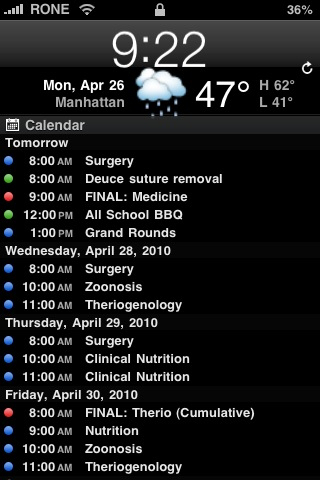 Colored bullet: real round bullet just like in iphone calendar interface would be prettier. Description: I mean the title of the event, if it's too long, it will be cut. Just like folder names in windows explorer. Long names that are cut, are displayed in full in a tooltip when you hover them. Is that description clear?